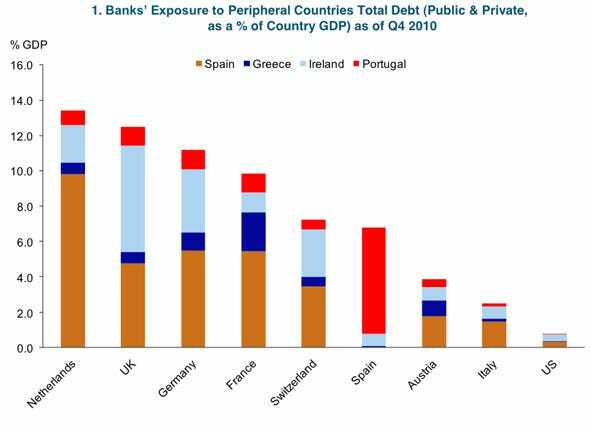 Bank exposure to the PIGS - public and private debt - as a percenatage of GDP in Q4 2010. This chart from Business Insider shows the total stake foreign banks of selected countries have in the public and private debt of the PIGS countries. You can see that Greece is not the big problem. is there a way you can post the data that pertains to the graph "bank exposure to piigs as a percentage of gdp"? i'm particuarly interested in estimated exposure in fair value to greece, spain, italy, ireland, portugal. thanks!